Plenary speakers: Alec Ryrie (Durham), Andrew Spicer (Oxford Brookes), Alexandra Walsham (Cambridge), Helen Wilcox (Bangor). The conference will be hosted conjointly by the research centres on the anglophone world of Aix-Marseille and Montpellier Universities, with Montpellier Faculty of Theology. 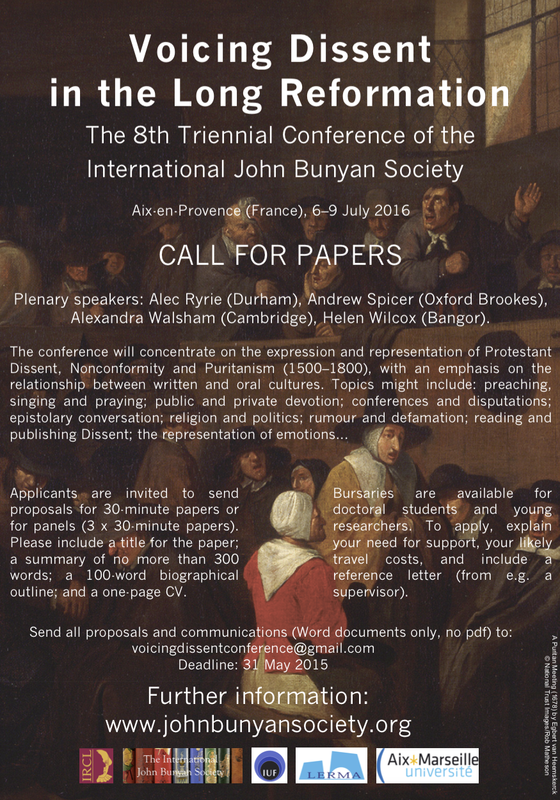 For further information about possible topics, please visit the CFP page. For practical details and accommodation, please visit the 2016 Conference home page on this website. To download a copy of the CFP poster, please click here. Members of the IJBS are of course very welcome to propose papers specifically on John Bunyan, and his legacy, that fit the general theme. Applicants are invited to send proposals for 30-minute papers or for panels (3 x 30-minute papers). Please include a title for the paper; a summary of no more than 300 words; a 100-word biographical outline; and a one-page CV. Bursaries are available for doctoral students and young researchers. To apply, explain your need for support, your likely travel costs, and include a reference letter (from e.g. a supervisor). See our Bursaries page. ORGANISERS: Dr Paula Barros (Montpellier), Prof. Luc Borot (Montpellier), Prof. Anne Dunan-Page (Aix-Marseille), Prof. Pierre Lurbe (Montpellier), Dr Laurence Lux-Sterritt (Aix-Marseille), Prof. Jean Viviès (Aix-Marseille). ADVISORY COMMITTEE: Prof. Margaret S. Breen (Connecticut, US); Prof. Sylvia Brown (Alberta, Canada); Prof. Vera Camden (Kent State, US); Dr Nathalie Collé-Bak (Lorraine, France); Dr Laurent Curelly (Mulhouse, France); Dr Michael Davies (Liverpool, UK); Prof. Françoise Deconinck-Brossard (Paris Ouest Nanterre, la Défense); Dr Rémy Duthille (Bordeaux-Montaigne, France); Prof. Katsuhiro Engetsu (Doshisha, Japan); Prof. David Gay (Alberta, Canada); Prof. Isabel Hofmeyr (Witwatersrand, South Africa); Prof. Jeffrey Hopes (Le Mans, France); Dr Galen Johnson (Ashford, US); Prof. N. H. Keeble (Stirling, UK); Prof. Thomas Luxon (Dartmouth, US); Prof. W. R. Owens (Bedfordshire, UK); Dr Roger Pooley (Keele, UK); Prof. Stuart Sim (Sunderland, UK); Prof. Nigel Smith (Princeton, US); Dr Tamsin Spargo (Liverpool John Moores, UK); Prof. David Walker (Northumbria, UK); Prof. Arlette Zinck (King’s College, Canada).